I've made it no secret that I fall on the salty side of the sweet-salty personality continuum. Blame it on my upbringing as the youngest and the only girl of three kids, or blame it on my natural instincts toward sarcasm and dry humor. Or blame it on my middle school years. One thing we can't really blame here is my diet: I eat plenty of sweets; too bad the bible verse doesn't say out of the overflow of the stomach the mouth speaks. If that were true, I'd be the sweetest little thing you'd ever meet. But the fact remains that I'm not sweet. I'm salty. I thoroughly enjoy subtle dry humor, and I'm much more likely to laugh at a sarcastic comment spoken in jest than I am to smile at a dripping-with-honey compliment. I often see this as a negative aspect of my personality (fits right in the negative category between my anti-social tendencies) and my awkward conversational pauses, which I alluded to here). Most girls, including myself, would prefer to be described as sweet over salty. No one ever says, "Oh, you're such a salty woman," or "You are just so sassy," and means it as a complete compliment. But if you're a girl/woman in the salty boat with me, hang here for a minute. There's some biblical encouragement headed your way. 13 You are the salt of the earth. But if the salt loses its saltiness, how can it be made salty again? It is no longer good for anything, except to be thrown out and trampled underfoot. 50 Salt is good, but if it loses its saltiness, how can you make it salty again? Have salt among yourselves, and be at peace with each other. From the verses above, I can garner that "salt is good." Salt preserves, salt makes things satiable, and salt adds flavor. This is not to say that honey and sweetness don't have their benefits, but salt has several redeeming qualities, one of them being to make things extra tasty and easy to consume. 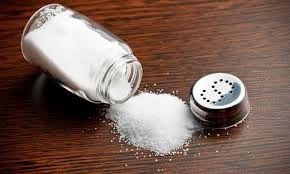 Therefore, my personal saltiness should not be used in a way that defames Christ, but in a way that glorifies Him, makes others want to "taste and see that the Lord is good" (Ps. 34:8), and makes them thirst for living water (Jn 7). This gives me, a salty girl, hope. This also challenges me to use my "salt" in a way that is pleasing to the Lord. At times, I have been discouraged by my saltiness, which I often see simply as "unsweet." And if I'm honest, my conversation has often been seasoned with too much salt and not enough honey. This is something I acknowledge and have prayed about. However, I still think God made me this way for a reason. It doesn't give me free reign to say and do as I please without regard to the feelings and tender hearts of others; it just means I communicate and think a bit differently. And that's ok. If given the choice between fake sweetness or saltiness, I would choose the salt every time.